Overhead Sliding shelving system EASY COMPACT. The ideal solution for anyone looking for more storage space, high hygiene and greater savings. This patented sliding shelving system, called EASY COMPACT, is the ideal solution when you want to organize, increase and exploit your available space to the full – especially in mid-to-small-sized rooms, with light loads – with a more affordable investment so that the system will pay for itself in no time at all. Employing central sliding tracks and two side shelving units to act as fixed supports, this sliding shelving version offers ease of material handling, excellent load capacity, reliable stability, high hygiene and great versatility in the way modules can be put together. The design of the adjustable sliding track means shelving length can be varied by 400 mm, thus adapting to suit different spaces. Using just three track lengths, you can cover lengths ranging from 2300 to 2700 mm (2245mm track), from 2700 to 3100 mm (2645mm track), and from 3100 to 3500 mm (3045mm track). The two central modules are lifted entirely off the floor, making it easier to clean underneath and thus assuring high standards of hygiene. Each sliding and fixed module, comprising 4 shelves, delivers impressive stability with a 250 kg load capacity. With its highly modular nature and two side shelving units acting as supports, this system allows you to add other fixed shelving modules – even one after the other – and thus create numerous compositions to make the most of your available space with a tailored organizational solution. 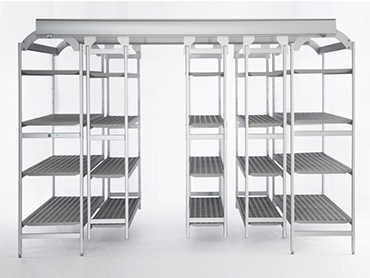 The system’s distinguishing features – namely the central sliding tracks and two side shelving units acting as fixed supports – make handling goods easy by optimizing the available space in each room and providing the best organizational solution.